This daltile castle metals 2 in. x 12 in. Wrought iron metal border accent tile simulates the natural look of stone with the cool texture of metal to accent your wall or backsplash. The tile's unglazed textured finish shines with a low sheen and features a uniform appearance in tone that complements a variety of decor. Resistance to breakage caused by weight and impacts up to 100 lb. And chemical resistance ensures that the tile endures wear and tear for lasting enjoyment. 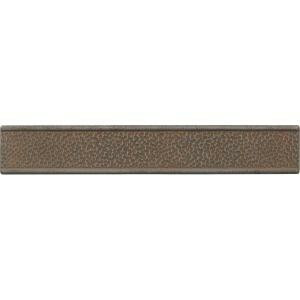 Buy online Daltile Castle Metals 2 in. x 12 in. Wrought Iron Metal Border Accent Wall Tile CM02212DECOB1P, leave review and share Your friends.